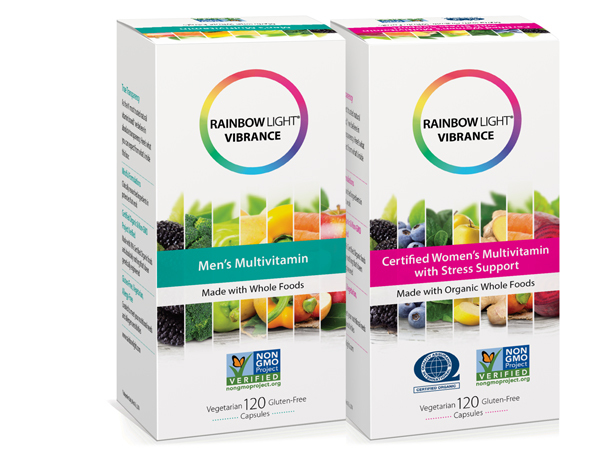 With significant improvements to their core vitamin line, Rainbow Light saw an opportunity to introduce a new premium line with customized attributes for women, men and teens. We worked closely with Rainbow Light’s marketing, product development and creative staff to transform their objectives into a comprehensive, innovative strategy that included the naming of the line, as well as package design and copy. Our key objectives in developing the new name and copy were to communicate the end benefit of the new line – enabling a vibrant life – as well as the customized attributes of each individual product. Rainbow Light’s current brand identity and graphic system, developed by Connector Branding in 2015, has been very well received by consumers and the trade, so we designed the Vibrance line intentionally to draw heavily on the parent brand identity while differentiating the new premium products on-shelf. The new design strongly communicates the food-based property of the new line, while signaling the non-GMO and organic certification (where appropriate).